Reps. Elijah Cummings and Eliot Engel claim Flynn promoted a plan to build 40 nuclear reactors in the Middle East while in office. Former national security adviser Michael Flynn is in the spotlight again, this time for allegedly promoting a nuclear power deal involving at least one sanctioned Russian company while he was still in office. 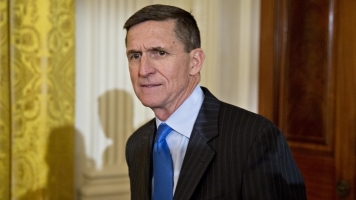 On Wednesday, Democratic Reps. Elijah Cummings and Eliot Engel released a letter saying Flynn worked with foreign business leaders on a plan to build at least 40 nuclear reactors in the Middle East. It says he made trips to Egypt and Israel in 2015 as part of this plan. Cummings and Engel say not disclosing that information could be punishable by up to five years in prison. Flynn is under suspicion of continuing to promote this plan while working for the White House. The letter states his trips were also left off his security clearance renewal application during the 2016 campaign and weren't revealed during his background check. The plan involved companies from nations as far-flung as Russia, Israel and the U.K. coming together to build and operate the nuclear plants. But the Russian entity meant to provide security for the project is under U.S. sanctions. Flynn's alleged business partners say he believed the project would help U.S. national security. Flynn disclosed that he served as an adviser at X-Co Dynamics, which is involved in the project, in 2015 and 2016. They also say the Trump administration kept the plan as a diplomatic option even after Flynn resigned. Flynn has been the subject of ongoing scrutiny. In April, former House oversight committee Chairman Jason Chaffetz said Flynn didn't get permission or disclose payment he received for a speech he gave on a Russian state-owned TV station. Cummings and Engel wrote Tuesday they are passing their findings on to the Department of Justice and special counsel Robert Mueller, who's also investigating Flynn as part of the ongoing Russia probe. Flynn's son Michael G. Flynn is reportedly also now a subject in the Russian investigation.